Jason Humber AKA the Photo Warrior discovered Gary Oliver, Urban Safari Rescue Society and the work we do and was inspired to create a couple videos and a gallery of cool animal pictures from around our facilities. You can view the photo galleries on our facebook page. The following is a video Jason Humber – Photo Warrior created when he became interested in Gary Oliver and the work of Urban Safari Rescue Society. 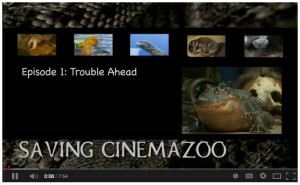 Urban Safari Rescue Society and Cinemazoo enjoy our popular status on YouTube. Check us out in this series of videos by Wendy Bancroft! SAVING CINEMAZOO, Episode 4: Hard Ride! Saving Cinemazoo, Episode 7 “Not Like Moving Furniture”! Saving Cinemazoo, Episode 9 “Investigated”! Episode12, “Cinemazoo, the Next Door”?